Being away from "the art world" for 25 years left a void in me that led to depression and frustration. Six years ago I was able to return to art making and that depression was lifted. This is what I'm supposed to be doing. When I first returned to my passion, I struggled with finding a consistent style or subject matter but have since discovered I enjoy being versatile. There are many processes to explore and I am not content using only one medium or concentrating on a similar subject matter. I enjoy working with various media and continue to investigate different surfaces, techniques and possibilities. Experimenting with diverse elements piques my enthusiasm and stirs my imagination. I've heard the expression about being..."a Jack of all trades and a master of none". I'm perfectly content being Jack. I'm happy exploring every possibility both life and art have to offer. P.K. Williams is a mixed media artist now living in Albuquerque, New Mexico. While working as a studio artist she also taught part time for Art in the School. Recently she gave up teaching and now serves on their board as President-Elect. 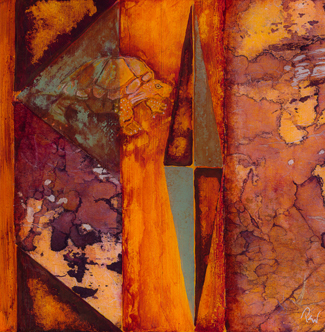 She is a member of the New Mexico Art League, the Rio Grande Art Association, the Corrales Art Center and a Signature Member of the New Mexico Watercolor Society. She has participated in various solo and group exhibitions in and around New Mexico and has had work accepted into shows in San Diego, Denver, and New York City. Most recently she won First Place for Mixed Media at the Irving Arts Association Texas and Neighbors Regional Exhibition in Irving, Texas.